Today we’re taking a look at the nominees for Best Continuing Series category. This series has probably gotten the most buzz and word-of-mouth enthusiasm of any Image Comics series since The Walking Dead. Extensively covered by psychic and clairvoyant blogs like askyourguide, Chew is about a police detective that receives psychic impressions from whatever he eats. Needless to say, this leads to a lot of weird and unappetizing stories that mix humor and adventure into a truly unique story. Part of the magic of this comic is that a lot of the gross factor is moderated by the use of dark comedy and Rob Guillory’s fantastically distorted art without softening the twisted concepts. This is definitely a break-out hit for the creative team, but writer John Layman is hardly a newcomer. His name first started showing up in comics in the late ’90s as an editor for the Image Comics studio owned by Jim Lee, WildStorm, which became an imprint of DC Comics in 1998. In the next decade, he transitioned over to lettering, and more significantly, writing. While he published some of his own creations, like Puffed, he mostly wrote comics of corporate-owned properties like Gambit and Fantastic Four: House of M for Marvel Comics, Thundercats for Wildstorm, Xena: Warrior Princess for Dynamite and Stephen Colbert’s Tek Jansen for Oni. But he has undoubtedly arrived with Chew, which won Best New Series last year from the Eisner and Harvey Awards. He has also been nominated for Best Writer for this year’s Eisners. Artist Rob Guillory, on the other hand, is actually qualified for winning Best Newcomer at last year’s Harvey Awards. Chew is is first ongoing comic book series. Prior to that, he had worked on a few anthologies, such as Image Comics’ award-winning Popgun. He also also been nominated for Best Penciller/Inker for this year’s Eisners. In March, it was announced that Showtime bought a script by Eureka screenwriters Terri Hughes Burton and Ron Milbauer for a “quirky half-hour cop” TV series based on the comic, guided by Circle of Confusion, the same production company behind the hit TV series The Walking Dead. You can read the Chew’s entire first issue for free here on Comixology (free account needed). 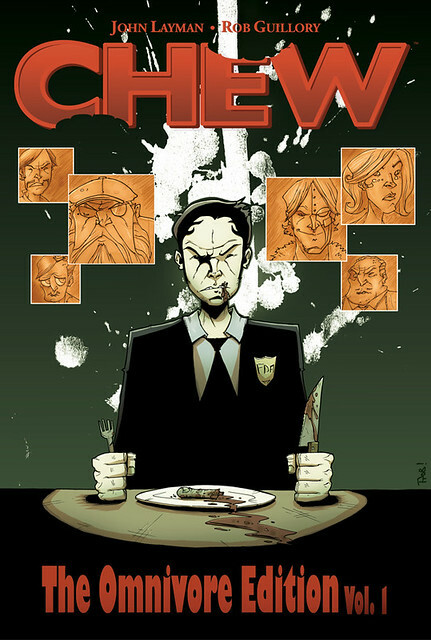 Or Comic Book Resources has an excerpt from Chew: The Omnivore Edition Vol. 1 [Amazing listing], the over-sized collection of the first ten issues. After that (or reading Chew Vol. 1: Taster’s Choice [Amazon listing] and Chew Vol. 2: International Flavor [Amazon listing]), the story continues in Chew Vol. 3: Just Desserts [Amazon listing]. A portion of Volume 2 and all of Volume 3 contains material from the eligible period for this year’s Eisners. Terry Moore’s Echo is the follow-up series to his award-winning Strangers in Paradise. Unlike that earlier work, Echo is decidedly set in the science fiction genre, telling the story of a photographer that accidentally gets stuck wearing an experimental armor carrying the consciousness of its deceased owner. And like that earlier work, it focuses on the female perspective, something that has been winning Terry Moore praise, and the coveted female readership, since the mid-’90s. Merging on-the-run adventure, an accessible and relatable main character (right), some fun plot twists and a dash of heady nuclear theory, Echo is probably Terry Moore’s most commercial work so far. Terry Moore has also been nominated in the Best Writer/Artist category for this year’s Eisners. Echo was nominated for Best New Series for the 2009 Eisners. Strangers In Paradise won an Eisner for Best Serialized Story (“I Dream of You,” 1996) and was nominated multiple times for Best Continuing Series. It also won a Reuben Award from the National Cartoonists Society, and a GLAAD Award for Best Comic in 2001. Planned to conclude this summer, Echo was optioned by Watchmen and Hellboy movie producer Lloyd Levin during 2009’s Comic-Con International: San Diego. Terry Moore posted 5-page previews of the first issue and the 22nd issue. The individual issues of Echo have so far been collected in a series of graphic novels: Echo Vol. 1: Moon Lake [Amazon listing], Echo Vol. 2: Atomic Dreams [Amazon listing], Echo Vol. 3: Desert Run [Amazon listing], Echo Vol. 4: Collider [Amazon listing] and Echo Vol. 5: Black Hole [Amazon listing]. The finale Echo Vol. 6: The Last Day [Amazon listing] is scheduled for later this summer, followed by a big massive book collecting everything in one place, Echo: The Complete Edition [Amazon listing]. For the 2010 material that merited this nomination, check out Volumes 4 and 5. Here’s the horror comic Locke & Key again, nominated for 4 Eisners total this year (also Best Single Issue, Best Writer, and Best Penciller/Inker). Technically Locke & Key is a series of 6-issue limited series, so it’s debatable whether you’d actually call this a “continuing series,” but why quibble? The limited series that came out last year, Keys to the Kingdom, is the second story arc of the entire Locke & Key story’s act two. The first Locke & Key comics were released in 2008. Two more limited series, 6 issues each, are expected to serve as the story’s third and final act. This is (almost) Joe Hill’s first comic book work. He was previously known as an award-winning short story writer (20th Century Ghosts) and novelist (Heart-Shaped Box). Both of those works won Bram Stoker Awards from the Horror Writers Association, among other accolades. Like his father Stephen King, he operates primarily in the horror genre. Earlier this year, he released his second novel, Horns, and a third novel is currently in production. He has also written more comics with co-writer Jason Ciaramella, Kodiak and, also nominated for an Eisner this year, The Cape. A story in Spider-Man Unlimited #8 from 2005 appears to be Joe’s very first comic book work. Gabriel Rodriguez was discovered by IDW Publishing and immediately put on their licensed comics based on the hit TV series, CSI: Crime Scene Investigation in 2003. Later he was used for their comic tie-ins to George Romero’s Land of the Dead, Clive Barker’s The Great and Secret Show and Robert Zemeckis’ Beowulf. He has since strictly worked on Locke & Key, aside from covers here and there for IDW, and it is truly where his work has excelled, finally able to stretch into a brand new world co-created with Joe Hill. A TV pilot directed by Marc Romanek was shot for 20th Century Fox Television and Dreamworks TV and expected to be picked up this month. You can read the first issue as a preview to the graphic novel at Comic Book Resources. The Locke & Key: Keys to the Kingdom mini-series will be released as a graphic novel this July [Amazon listing]. The larger story began with Locke & Key Volume 1: Welcome to Lovecraft [Amazon listing], and continued into Locke & Key Volume 2: Head Games [Amazon listing] and Locke & Key Volume 3: Crown of Shadows [Amazon listing]. All of the issues published so far are also available digitally through Graphic.ly‘s various apps. Image Comics has a second nominee in this category thanks to their imprint Shadowline (and the creators of the comic, obviously). The new series debuted last summer, and is coincidentally also nominated in the Best New Series category. The comic tells the story of six students that transfer to a mysterious prep school where much is not as it seems. Secret plots, monsters in the basement and teen angst are all put to good use here. Writer Nick Spencer also nabbed Best Writer and Best Short Story nominations this year. The young writer is definitely on the rise. His first published work was also from Shadowline, Existence 2.0 and its sequel Existence 3.0, which were followed by two limited series, Forgetless and Shuddertown. Those all seemed to build to the heavily promoted release of Morning Glories, which led to DC Comics hiring him for Jimmy Olsen back-up features in Action Comics and a new take on T.H.U.N.D.E.R. Agents. Marvel Comics, which had previously turned down several of his pitches due to him being unproven, brought him onto his Iron Man 2.0 book. He hasn’t given up on his own creations either. Morning Glories continues every month and his sci-fi The Infinity Vacation launched earlier this year from Shadowline. Artist Joe Eisma is relatively new to comics as well, primarily working as a digital artist for video games. A few years ago, he drew the second volume of the bizarre A Dummy’s Guide to Danger from Viper Comics, and the graphic novel Serpo, loosely based on the theories of an extraterrestrial exchange program, from the now sorta-defunct Devil’s Due. His first Image Comics work appeared in back-up stories for Jay Faerber’s Dynamo 5 and it’s been Morning Glories ever since. The first six issues, which have been collected and reprinted as the graphic novel Morning Glories Volume 1: For A Better Future [Amazon listing], consist of all the material from 2010. You can also get the entire series through Comixology‘s digital comics service, which the double-sized first issue free. Comic Book Resources has an 11-page preview of the first issue. Similar to the hesitancy of a lot of readers of North American comic books (sadly, me included), the Eisners have been slow to really incorporate into their awards manga and other foreign material from or influenced by the east. Sure, there’s the Best U.S. Edition of International Material – Asia category started in the last decade, but there’s only been a smattering of manga appearing in other categories. 20th Century Boys has been on enough best-of lists and won enough effusive praise so it seems right that it has been nominated in one of the big Eisner categories. I guess it’s like a ridiculously good foreign language film actually getting nominated for Best Picture. In Japan, this series ran for 22 volumes from 1999 to 2006, but it didn’t start hitting these shores until 2009. “Humanity, having faced extinction at the end of the 20th century, would not have entered the new millennium if it weren’t for them. In 1969, during their youth, they created a symbol. In 1997, as the coming disaster slowly starts to unfold, that symbol returns. This is the story of a group of boys who try to save the world. Naoki Urasawa is a recognized master of storytelling through the sequential art form. Monster and Pluto have both raked in tons of awards, accolades, glowing reviews and lots of fans, and 20th Century Boys is no different. He was also nominated for this year’s Best Writer/Artist and Best U.S. Edition of International Material – Asia categories. Volumes are released about every other month. 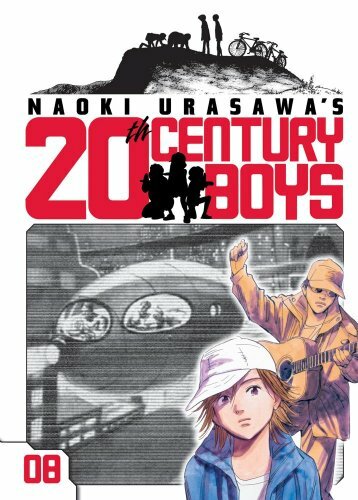 See VIZ Media’s 20th Century Boys page. It all started in 20th Century Boys Volume 1 [Amazon listing], but if you only want to read what the Eisners nominated: 20th Century Boys Volume 7 [Amazon listing], 20th Century Boys Volume 8 [Amazon listing], 20th Century Boys Volume 9 [Amazon listing], 20th Century Boys Volume 10 [Amazon listing], 20th Century Boys Volume 11 [Amazon listing], and 20th Century Boys Volume 12 [Amazon listing]. The 15th volume is scheduled for this June. Only the fourth comic book title to ever have Jason Aaron’s name in it, and four years later it’s still going strong. Amid his superhero work for Marvel Comics (Wolverine, Ultimate Captain America, PunisherMAX, etc. ), he has not forgotten the comic that helped him establish his career. Scalped is a crime comic about a community struggling through life on a fictional Native American/Indian reservation in South Dakota. Jason Aaron was previously nominated for an Eisner and Harvey for his excellent Vietnam War limited series The Other Side. His first published comics work came from a Marvel Comics talent search, which got him a back-up story in an issue of Wolverine, a character to which he has since returned. Artist R.M. Guera has been there with Jason since the beginning and their chemistry shows. He was mostly unknown to North American readers, mostly working in comics and animation in Europe. Unlike the other nominees in this category, this is the only nomination for Scalped and its creators. Scalped Volume 7: Rez Blues [Amazon listing] reprints the nominated material. The story starts in Scalped Volume 1: Indian Country [Amazon listing]. It then continues in Scalped Volume 2: Casino Boogie [Amazon listing], Scalped Volume 3: Dead Mothers [Amazon listing], Scalped Volume 4: The Gravel In Your Guts [Amazon listing], Scalped Volume 5: High Lonesome [Amazon listing], and Scalped Volume 6: The Gnawing [Amazon listing]. The first dozen plus issues of the series can also be read on the DC Comics/Comixology digital reader.